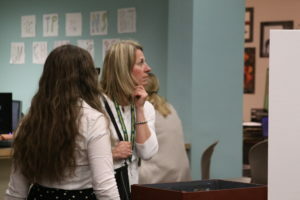 Mrs. Selep listens to Maura Corder and Ethan Woodfill’s presentation about the 1933 Boycott of Jewish Businesses in Nazi Germany. 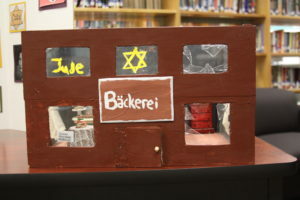 The students had a small scale model of a bakery, pictured below. 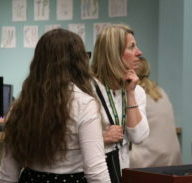 The Collaboration Center was crowded with a mix of presenters, parents, administrators, and students. 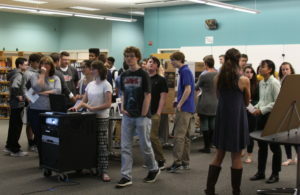 The presenters set up tables and chairs in a maze-like formation, with several projects in the classroom at the back of the Center and the Writing Lab. 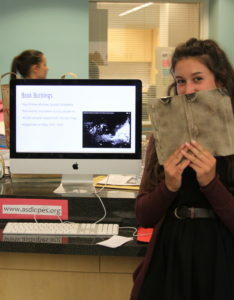 Bethany Kujawinski presented about one of the largest Book Burning events on its 83rd anniversary. She carefully burnt a journal in representation of the event and its effects. 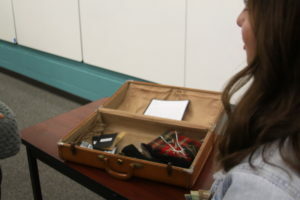 Julia Wimer, pictured above, mixed original creations with historical artifacts from a relative who served in WWII and helped to liberate prisoners in a Concentration Camp to show Immigration and Emigration during the Holocaust.